Here at Gawker Media, we love us some swag. But, really, who doesn't? And like our iced coffee and free-lunch-Wednesdays, we take our gear very seriously. That's why we turned to Florida-based apparel screen printing pioneers, Real Thread, when we needed some new Gawker team hoodies earlier this year. Thanks to their special water-based & discharge ink screen printing methods, the Real Thread team is making some of softest swag around. Now, they've packed up and are out on a 10-day tour around New York doing shirt-related activities with companies like CreativeMornings, Brooklyn Beta and General Assembly. After a great experience working with them this past Spring, I jumped at Real Thread Community Manager, Nathan Beam's, invitation to get in on the tour. 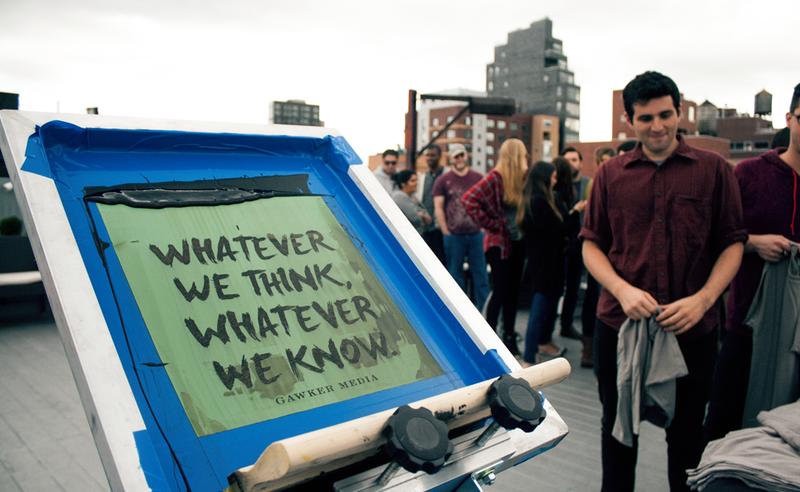 Here's a look at Real Thread's visit to the Gawker Media HQ rooftop, where about 90 staffers showed up to screen print their own custom shirts with help from a few of Real Thread's master press operators. Not surprisingly, many clever Gawkerites got creative with the original "Whatever We Think, Whatever We Know" design, and we ended up with quite a few whatever and we know tees. Sounds appropriately on brand for us actually. Photos by Real Thread & Studio@Gawker.